I can't really say this was a wedding, either. We eloped. 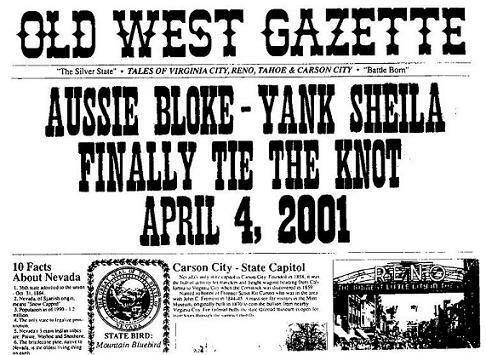 The day before, we got the marriage license in Carson City, NV. We took a drive up the mountain, the following day to Virginia City, which is about a half hour away from Carson. I was quite nervous that day, because this is my second marriage. I didn't want it to end up being like my first. Since I knew the area better, I drove to Virginia City, nervously flipping through the radio stations on the way up there. Besides, this was no great place for Wayne to drive and then take a chance jumping to the opposite side of the road, which is the norm for an Australian. The road was very curvy, and somewhat dangerous. Virginia City is a rustic old town from the days of the Old West, preserved for tourists. It was really cold and windy that day. Once we got there, we waited at the bar of the Silver Queen Hotel for the minister to arrive. After the minister showed up, we went to the designated room where the ceremony was held. The room was ice cold and had that old, musty smell. I started laughing as I grabbed Wayne's arm. I said to him, "This place smells like my old Sunday School classroom in the basement of the church." He was trying not to laugh, as he clenched his teeth together. He snapped, "Can we get through this without you bringing up, bloody Sunday School?!" (Wayne has teased me often about the military and he tells me that he thinks I'd rather go to jail, than reenlist in the Corps, which is true, but I always get one back on him with this. He never liked going to Sunday School. This is his theory: He never liked the idea of having to get up at a sparrow fart to go listen to some preacher telling him how to live his life, when the preacher, himself lives like a pompous hypocrite. Now, to me, that's not always true. It just depends on the church you go to. But of course, bringing up church to him always gets the reaction out of him that I like. It's hysterical!) Yet, the last thing I would want my mother to know is that my husband is agnostic. When the ceremony started, I could tell Wayne was a bit nervous. While he was saying his vows, I noticed that his accent became really strong. There for a second, it was hard to understand him. Unfortunately, we didn't plan this too well, because even though he had been over here a few times before, we really didn't have an exact date. It was basically a spur of the moment kind of thing. Of course, we had talked about it for a long time, but talking about it and actually doing it are two different things. Shopping for a wedding band for him was impossible. Every jewelry store didn't have one his size. (To a superstitious pessimist, this would be a sign not to go through with it, but we did, anyway.) Talk about being unprepared!!! I felt like I was a teenager in a rushed wedding, like in the movies, "Coal Miner's Daughter", and "Great Balls of Fire". He ended up having a wedding band custom made for him, back in Oz. After the ceremony, he decided for sure that he wanted to take my surname, which is totally out of the norm, Funny thing is that a man has to go through the legal system and get it changed through the courts. For a female it's just automatic. I wouldn't have minded being Mrs. Love, especially if my first name was Courtney:). But, for a man, it's not too masculine. He wanted mine instead. Trying to explain this one to immigration was a bit confusing at first. Coming up with this headline for our souvenir paper was easy. People had been asking us for a couple of years prior, when we were actually going to get married. 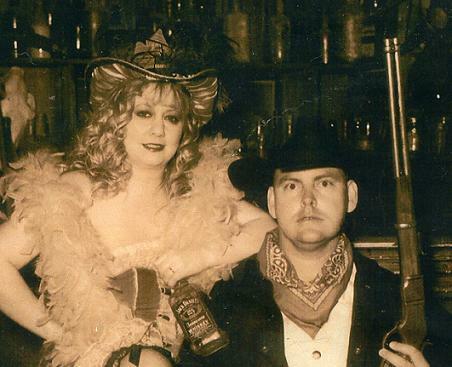 We had an old time photo taken of us, along with our newspaper headline. Ah yes, souvenirs and memories of a cold, windy day in Virginia City. After we left there, we went to Olive Garden in Reno for dinner. Wayne mentioned to our waiter that it was our wedding day. Then of course the staff came to our table at dessert time and sang, wishing us luck. That's when it dawned on me. Oh my God!! I'm married!!! I started to feel the lump in my throat as if I was about to cry. It was a combination of feelings that was such an instant rush. I was a single woman for six years after my first marriage ended. I liked being single very much and enjoyed my freedom, yet I love Wayne too. It was feelings of stress, joy, fear, sadness, happiness, and excitement, all combined. Wayne knew this too and said, "Well this is not exactly easy for me either." "At least you have done this before." He went back to Oz and it was back to work. I later got online and found an email from someone I went to high school with. I told her that I had company coming in from Australia, but I didn't really say anything else. She knew I was getting married and mentioned that it wasn't a good idea to "jump" into things. It was too late, because I already did, but this wasn't a relationship that I just jumped into. I had lived with Wayne the majority of the time I was in Australia and knew him for 2 1/2 years before we married.